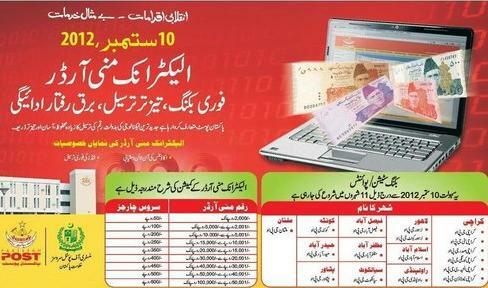 Pakistan post has launched Electronic Money Transfer (EMO) initially in eleven big cities including Islamabad, Rawalpindi, Lahore, Faisalabad, Multan, Sialkot, Peshawar, Quetta, Karachi and Hyderabad through 17 General Post Offices (GPOs). This service is instant like easypaisa, Customers will be able to send upto Rs.100,000 throughout EMO service locations for very cheap price. Its cheap than easypaisa but not popular as easypaisa is found in each and every street.